It's time for a new recipe post! 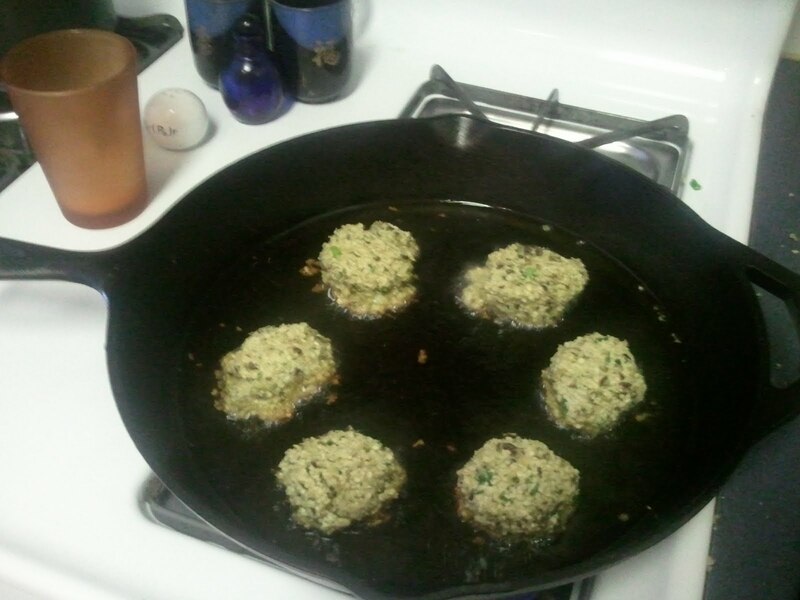 This one is black-eyed pea croquettes from Alicia Silverstone's book, The Kind Diet. Black-eyed peas are in season! I never used to be a huge fan of them (I love the band, though!) but well the story goes... first I saw these "zipper cream peas" in the store a couple weeks back, and I was like, what the heck is that? Naturally I had to buy them. They were in the produce and setting on the shelf next to black-eyed peas - both sold in a bag for like $2 a piece. I bought the zipper creams and proceeded to google recipes. I found a "Soup Pasta Escarole and Zipper Cream Pea Casserole" recipe though after making it, it was very tasty but didn't seem casserole-ish to me, since there was no cheese or no substance holding the peas all sort of together. It was like peas and some other stuff baked in a dish. I modified some of the ingredients too, so maybe that made a difference. Some of the ingredients included escarole, Kashi 7-whole grain pilaf (I used this instead of pasta because I was making it macrobiotic), and chopped veggies - onions, carrots, scallions, garlic. 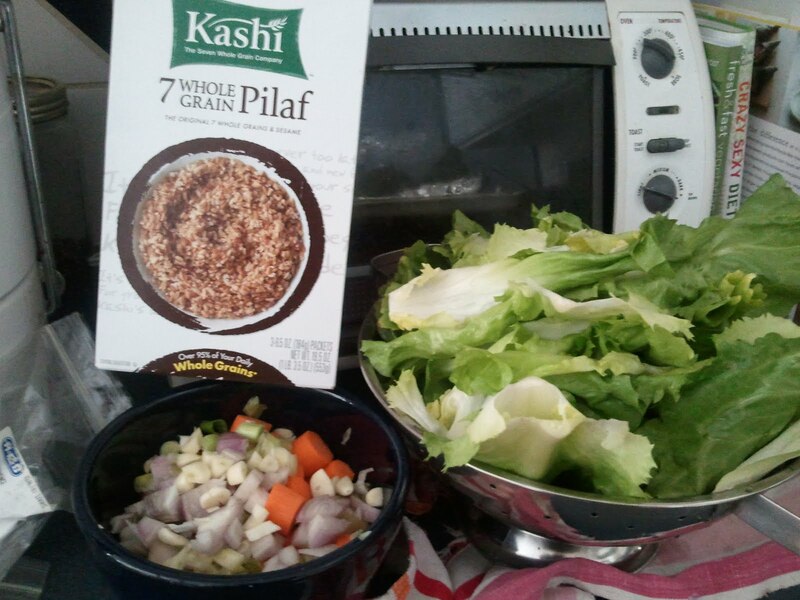 The Kashi stuff is soooo good! The final product! I am just going to link to the recipe, rather than typing it up here, because it's kind of long! While it was good (I liked the zipper creams) I don't think making it into a casserole was worth it because it took too long for something that really wasn't all that casserole-like. I think it would have been just as tasty to stir-fry the veggies, cook the peas and rice/pilaf and toss it all together sans baking. 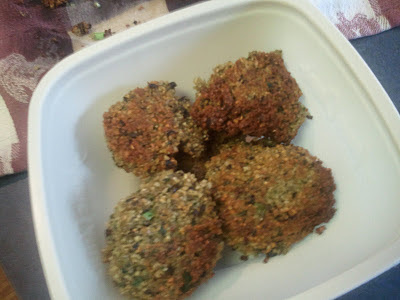 Next here is the recipe for black-eyed pea croquettes. You can certainly do this with zipper creams too, since they are very similar. 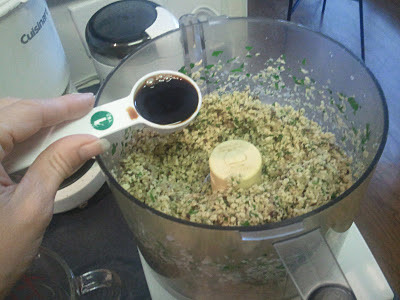 Drain the soaked beans and transfer to a food processor. Add the parsley or cilantro, salt, shoyu, and cumin. Blend until the beans are chopped to fine shreds, but don’t blend them to a pulp. The mixture will be slightly wet but should hold together. Form the bean mixture into something between football and UFO shaped croquettes in the palms of your hands. Heat 1” of oil in a cast-iron skillet to about 350 degrees Fahrenheit. To test the oil, drop in a tiny amount of croquette mixture. If it bubbles furiously and rises to the top, the oil is ready. Do not let the oil get so hot that it smokes. You may need to make little adjustments to the heat throughout the cooking process to avoid burning the croquettes. Place 4 croquettes in the oil and fry for about 4 minutes on each side. Use a slotted spoon to transfer the fried croquettes to a plate lined with paper towels. To make the dipping sauce, stir together the barley malt syrup and mustard in a small saucepan. Warm the sauce until it bubbles. Serve the croquettes while still hot. Drizzle with the dipping sauce or serve it alongside in a dipping bowl. 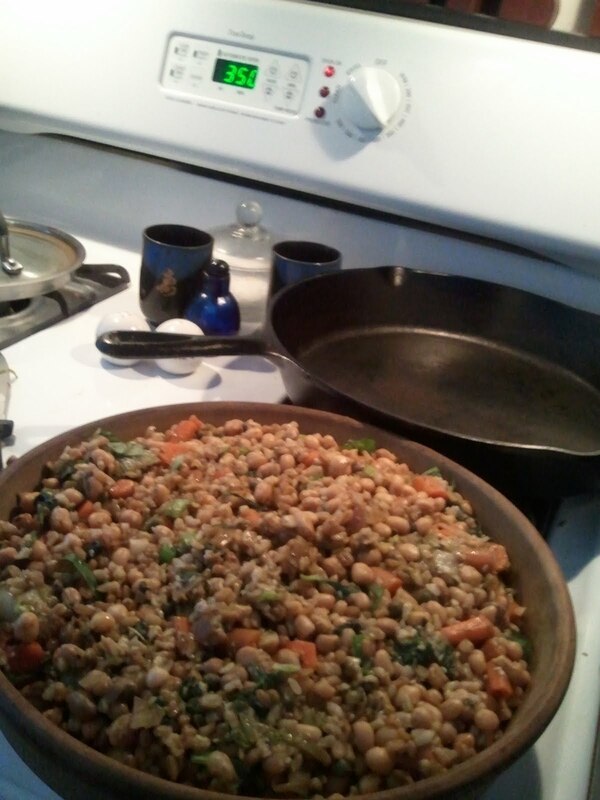 The photo at the top of the page is the croquettes cooking in my cast iron skillet (I bought it recently - they're cheap! - because apparently the nonstick coating on pans is really bad for you. Good ol cast iron is a trusty friend. I grew up with my dad using it, but have never had my own. Now I do.) The photo of the croquettes in the container is the final product. They were quite good - even the kids liked them. OK I take that back - Savi liked them and Sam didn't. My best attempt at looking French! Ha ha! This is from a couple years ago. "I guess when you're young, you just believe there'll be many people with whom you'll connect with. Later in life, you realize it only happens a few times"
So, something made me remember the Before Sunrise and Before Sunset movies (a new one is reportedly being made) and so I watched them recently. Wow what a trip. In the first, two meet on a train and share 24 hours together in Vienna. Mostly the movie is dialogue. They end planning to meet again in 6 months but decide to not exchange phone numbers. Céline is the romantic and Jessie, an American is cynical in love and life, though he certainly falls for her. Fast forward 9 years, and in the sequel, Before Sunset, he's in Paris on the last stop of his book tour. He'd written a fictional book about a love relationship that is, in fact, based on their experience. Céline shows up at the reading and they proceed to spend the next few hours together before he has to fly home. It turns out she never showed up 9 years before because her grandmother died. But he did. In this movie, she has become the cynic and he has taken from his brief encounter with her a more optimistic life view, though he also has been "stuck" in an unhappy marriage. The scene very close to the end in the taxicab is the most intense, where they both get honest about their lives and the disappointments that came from the missed connection from 9 years before, and how it affected their lives. Céline: "For me it's better I don't romanticize things as much anymore. I was suffering so much all the time. I still have lots of dreams, but they're not in regard to my love life. It doesn't make me sad, it's just the way it is." Jesse: "Is that why you're in a relationship with somebody who's never around?" Céline: "Yes, obviously, I can't deal with the day to day life of a relationship. Yeah, we have, you know, this exciting time together and then he leaves and I miss him, but at least I'm not dying inside. When someone is always around me, I'm like suffocating!" Jesse: "No, wait, you just said that you need to love and be loved..."
Céline: "Yeah, but when I do, it quickly makes me nauseous! It's a disaster... I mean, I'm really happy only when I'm on my own. Even being alone, it's better than sitting next to a lover and feeling lonely. It's not so easy for me to be a romantic. You start off that way, and after you've been screwed over a few times you, you forget about all your delusional ideas, and you just take what comes into your life. That's not even true, I haven't been screwed over, I've just had too many blah relationship. They weren't mean, they cared for me, but they were no real connection, or excitement." And so watching the movies made me think back to the time, some 6 years back, when I started this blog. And I decided to write my love life (much of which has only been very subtly written about here) in a 5-act play - somewhat tongue-in-cheek! Act 1: Marry handsome, intelligent man. Become someone you aren't in order to try to be/appear the perfect wife and mother, all the while failing miserably at making either party happy. Divorce (after 13 years). Act 2: See light at the end of the tunnel. Project all hopes and dreams of love and happy-ever-after onto poor unsuspecting guy (who lives 2 hours away). Light is actually a runaway train that smashes headlong, very shortly after the light is first seen. Fall into deep depression. Act 3: First online dating experience turns into worst nightmare. Military guy (who lives in WA but was in Iraq) convinces me I'm everything-he-wants-in-a-woman (flattering, ego-boosting, romantic-love-idealizing). Go on cross-country adventure. Think I fall in love. Meet a few more times... Intuit something is wrong, break up but really hoping it will work out in the end. He bolts (not what I expect). Months later, I learn he had several other "loves of his life" around the U.S. Complete shock and disillusionment. The beginning of the death of romanticism. The beginning of my blog. Act 4: Three years of singledom pass. Meet passionate, intriguing, spiritual Aussie on boat while wrangling sharks. Halfway across the planet. (Anyone see a pattern?) His attention is flattering, and dreams of our potential shared adventures exciting. Date four months before realizing Aussies like to drink. A lot. A lot a lot. Act 5: Meet guy in my city!!! Such a huge accomplishment I date him for 2.5 years. Break up 9,999 times. Get engaged. Break it off. Knew he wasn't right about 6 mo in. Why did I stay? You tell me. Finally end it for realsies....Lonely for the first time in a while. Act 6: Perhaps: Meet knight in shining armor who will carry me off into the sunset!? One can dream. 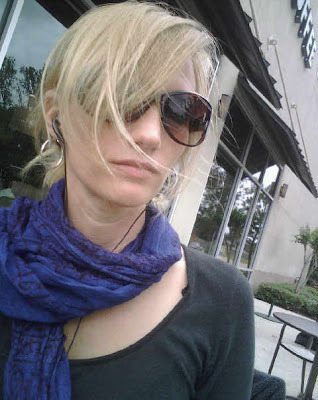 I am far, far, far more aware of how I idealize love, and how I need to be more realistic, while not sabotaging my chances at actual happiness. Balance is key. I am far, far, far more aware of the fact that trust should be not granted automatically, but needs to be built slowly. Generally speaking I am much happier and very content with the life I have lived the past several years. I've created an awesome, fun, adventurous career and life and nurtured several intimate friendships with women who I adore and respect. I am supporting myself, living my dream - really an amazing blessing! So there ya go. A nice round of introspection as we turn the corner on Thanksgiving 2011. If I don't get a chance to blog tomorrow (today), may you all have a truly blessed Thanksgiving! As for me, I am staying home, my myself, researching an article. Lame but true. I'm skipping the holiday this year! 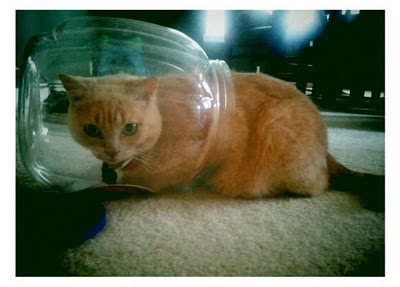 My cat is losing her fool mind! I bought this jar full of treats for Halloween, and since the treats are all given away, the jar is empty and my kitty thinks it is her new home - or at least the home for her head. 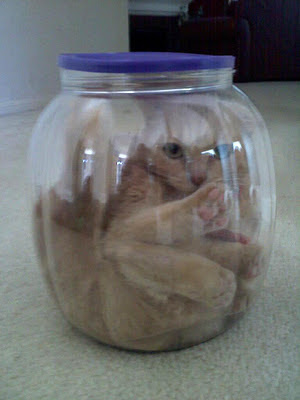 It all started out like this... After she seemed so interested in the jar, my kids thought it would be funny to shove her all the way in. I know, I know animal cruelty right?! What can I say? The lid wasn't actually placed all the way on! So then, you'd think she would never want to go in there again, right? Wrong! 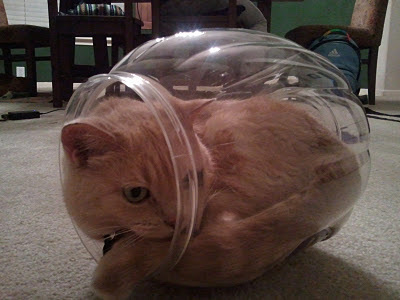 Kitty decided that she wanted to climb in as much as possible. She spent the next several weeks enthralled with the jar. Isn't she a cutie? 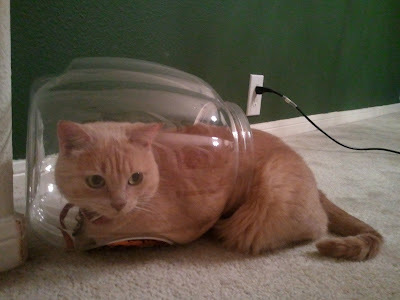 But most of the time she didn't climb all the way in, but rather was found like this... After a while she got sick of the jar, so I stuck a little catnip in there and it renewed her interest for a while. Now she is bored of it again... 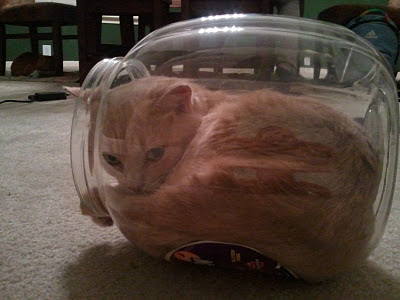 I'll just have to stick some more catnip in there because it cracked me up when I saw her in there, every time! I turned in my article based on my dive to the Aquarius Undersea lab (for which I interviewed Steve Squyres - from the last blog post about pooping undersea... LOL! That was a funny conversation!) I don't know when the article will be published, but I'll keep you posted. I turned it in a wee bit long - not something I usually do, but I have for the last couple of articles because of strange circumstances! There are sometimes stories that just absolutely require more space for proper telling. It is not my normal modus operandi to turn stories in over word count. At any rate, I'm now working on article on another scary chemical/plastic danger - obesogens (chemicals that make you fat!). After doing the piece on BPA, reading about microplastics, and now this article on obesogens, I want to discarding about every plastic thing in my house at this point, especially stuff I put food in! I already got rid of my old plastic water bottles (unlined aluminum and steel only for me!) and never, ever heat anything in the microwave in plastic (never did, though). I do sometimes use plastic tupperware to store food but I have a few glass containers with lids and I think I will look for more. Well I better get back to my reading! Soon I will post a few recipes I have tried out recently. Working on that post already - peace out! Blame it on my deranged mind, but I had to wonder to myself, when one lives in this tiny little undersea habitat called the Aquarius - the yellow-submarine-like-but-stationary-undersea lab that I dove to a couple weeks back - and they stay there for weeks or days at a time, how does the toilet situation work? It all started when I imagined myself living on board the Aquarius, as I'm writing up this article about it. I assumed there was a toilet in the lab itself, but that it would get a little, um, awkward and not to mention smelly, to poo in such tight quarters. So I asked Steve Squyres about the pooping situation. If you don't know him, he is a Cornell Astronomy professor who pioneered the Mars Rover. He was one of 6 aquanauts to live in the Aquarius for several days while figuring out the initial stages of just how one would get around on a near-earth asteroid in space - the mission that started the day I was out at the Aquarius (he's in the pics on my blog post SEJ Dive Trip Extraordinaire). The weightlessness of the undersea world is a good analog for deep space. Got it? Good. Here's our email conversation (technically an interview for an article - not kidding there either - though somehow I don't think this will make it in). I was laughing out loud! SS: Ah yes... the toilet question. :) Aquarius does have a toilet, but as you can imagine it's hard to get something like that to work well for that many people in that small a space for a long time. So it is used only during decompression, when the habitat is sealed. The rest of the time, we simply go outside. It's not quite as weird as it sounds. Right next to the habitat is something called the "gazebo." It's got air, and its primary function is as a shelter in case of emergency. But it also functions as an outhouse. Once you are there, you are greeted immediately by many very enthusiastic fish -- mostly chubs and angelfish -- who will almost literally eat anything. Me: What! How do you go #2 outside? SS: That's what I was trying to tell you... the fish (chubs and angelfish) eat it all in a matter of seconds. It really is a challenge to make sure you don't get bit during the fishy melee that ensues. Me: Ohhh!!! The fish eat it?!! Ewww!!! SS: One of those weird personal sacrifices you make in the name of science. I never actually got bit, but a couple of the others did. Those guys have sharp little teeth! Me: I sound like my teenage son (my fascination with poo that is)... I have to tell him this story. SS: It really hasn't come up in any of my other conversations about NEEMO... even the lecture I gave to my class about it. You were the first to ask! Well there ya go!! What people do in the name of science. Could you do it?!!! I am not so sure I could. Heck I can barely pee in the water, and then only if my life depends on it! And just so I didn't feel quite like such a weirdo, Wendy Watkins, who works in NASA Public Outreach & Education - said it is one of the most asked question. However, the astronauts apparently think talking about pooing undersea distracts from the interesting science they are doing. LOL. I think that people are very interested in the human dimensions of both space travel and undersea work, so, there ya go!